All floral arrangements of beauty and originality are produced with an understanding and appreciation of form, structure, construction and materials. These principles form the basis of modern flower design, in the same way a colour spectrum composes the nuances of a rainbow. Understanding and being able to create fresh new designs following a single principle is the first step. Once you have mastered each principle, and are able to combine them, an explosion of forms and colours awaits you. By understanding the underlying systems, you will find that the floral design possibilities are endless. These are the "mathematical secrets" behind my creations. 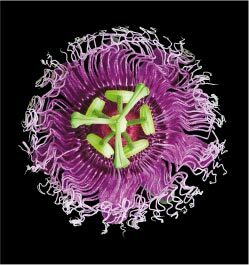 Tamarind Village's latest exhibition, FlorESSENCE: Essence of Modern Flower Design,was inspired by the launch of celebrated Thai floral artist Sakul Intakul's latest book of the same name in February 2011. The first volume in a planned two-part series, "FlorESSENCE", a 234 page, beautifully bound study of his work, follows the artist's other successful publications including Tropical Colours: The Art of Living With Tropical Flowers and Dok Mai Thai: The Flower Culture of Thailand. Unlike Sakul's earlier books which focused on the visual appeal of flowers and their meaning in Thai culture, the book FlorESSENCE: Essence of Modern Flower Design moves in a new direction, revealing what the artist calls 'the secrets' and 'visual patterns' behind the art of floral design and its four essential components: The Vertical; The Horizontal; Cubes & Squares; and Circles & Spheres. These four core principles which underlie his work, give structure and visual cohesion to each of his floral arrangements. Revealed in richly colored, beautifully photographed images taken by Jirasak Thongyuak, the book's simple yet dramatic principles add depth and meaning to the way that the designer's creations and his view of nature itself can be understood. The cool bamboo archway that leads from busy Rachadamnoen Road to Tamarind Village's quiet, garden-filled courtyard interior marks a clear transition from the world beyond the hotel's entrance to the world within. Art and literature throughout Asia pays homage to the calm and cooling effects of bamboo, its refined and elegant beauty, striking aesthetic form and innate qualities of strength and flexibility. Sakul, upon encountering Tamarind's archway for the first time, imagined himself lost in a bamboo forest on a mid-summer's afternoon. 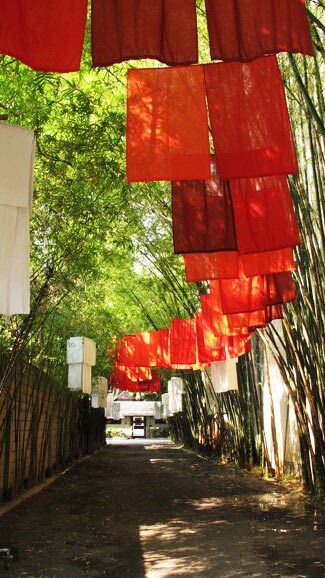 The installation he created 'Petals in a Bamboo Forest,' attempts to recreate this fleeting moment in the artist's imaginary world when a light, warm breeze carries a flurry of sweetly-scented, orange Flame of the Forest petals into a serene bamboo grove. Awakened by the softness of the falling petals, the resilient bamboo seems to spring to life and dance along with the seductive rhythm of the warm summer breeze. In creating the installation, Sakul tried to capture a state of mind and the thought that 'Precious moments, when nature seems to work in perfect synchronization, help remind us of the uncertain nature of the universe, urging us to live more fully and more consciously'. 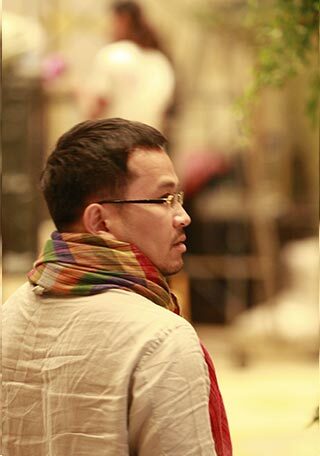 Engineer turned floral artist SAKUL INTAKUL is well known for conveying philosophical ideas through visually stunning installations and floral displays. His works possess a distinctive line, texture and sculptural quality and adjectives such as breathtaking, bold, delicate, modern and timeless are often used when describing his creations. There is also a spiritual bent to his work and the sense that the artist is concerned with universal questions of beauty and culture which he explores through his unique arrangements. force behind all his innovative artistic creations. When explaining his work, the artist notes that 'Flowers are so close to our lives that we tend to take them for granted. I hope that through my work I might encourage people to look at flowers in their lives more closely.' Sakul's creations invite viewers to take a second look at a familiar subject and to see it through fresh eyes. Sakul drew his ideas for the exhibition and for the installation series from the hotel's setting at the heart of the historic old city of Chiang Mai. Shown against the backdrop of its namesake 200 year-old tamarind tree, his Lanna-inspired floral 'sculptures' offer a perfect compliment to Tamarind Village's charming northern Thai design and architecture. Creative, inspiring and light hearted, the sculptures touch on different facets of northern life and include references to the umbrellas of Chiang Mai's Bor Sang Village and the tradition of bamboo basket weaving while one playfully incorporates colorful everyday objects including plates and utensils found readily in local markets throughout the region. One display is made from the fat, locally-rolled 'cheroot' cigars smoked by northern Thai villagers in the past. Here the artist pairs the soft feminine blossoms of deep-red orchids with the straight, strong lines of the cigars to create a sculpture that is both delicate and striking. Beautifully framed photographic images from the book FlorESSENCE are displayed in the hotel’s main corridor.Seen individually, rather than in the context of the book, each image is appreciated as work of art in its own right. A distinctive architectural feature of the hotel, the Tamarind Corridor was inspired by the style of architecture found at Wat Ton Kwien; a charming temple located in Chiang Mai’s Hang Dong District and one of the finest and best-preserved samples of traditional northern Thai architecture remaining today. Connecting the hotel’s public spaces to the quiet green interior of the main courtyard, the corridor with its stark whitewashed walls and terracotta tile roof makes a fine backdrop for showcasing the deep, rich colors of Sakul's work. The exhibition continues in the Tamarind Gallery located above Ruen Tamarind Restaurant. Here one finds a number of displays focused on the role of flowers and floral arts in traditional northern Thai culture. There is a panel which highlights the fascinating Thai art of floral offerings such as suay dok, and kan dok while another examines the elaborate bai sri ritual centerpiece used to commerorate important religious occasions and royal ceremonies. One panel offers a rare glimpse into the rituals of the past with archival film footage showing the arrival of HM King Prajadhipok (King Rama VII) and HM Queen Rambhai Barni into Chiang Mai in 1927. The film, recorded in part by the King himself, highlights the elaborate floral arrangements and bai sri offerings prepared to mark this special occasion. In addition to offerings and ritual arrangements, the exhibition also looks at the special role played by flowers and plants in northern festivals such as Yi Peng, held on the full moon in November, when local people adorn their homes with ‘Pratu Paa’ ‘forest gates’ (a decorative archway made from young banana trees, palm fronds and sugarcane plants decorated with colorful flowers and northern Thai style lanterns) and make kratong (folded banana leaf) offerings for the river goddess Mae Kongkha.